There is some debate as to whether an adenomyoma is really a neoplasm or is simply an exaggerated form of the Rokitansky-Aschoff sinuses that occur in chronic cholecystitis; current opinion favours the latter. The lesion is localised to the fundus and macroscopically looks like a multiloculated cystic mass. Microscopically the lesion is composed of dilated invaginations of the mucosa of the gallbladder that permeate the smooth muscle of the muscularis propria extensively. No desmoplastic response is associated with the glandular invaginations and no dysplasia is observed. A macroscopic picture of an adenomyoma. 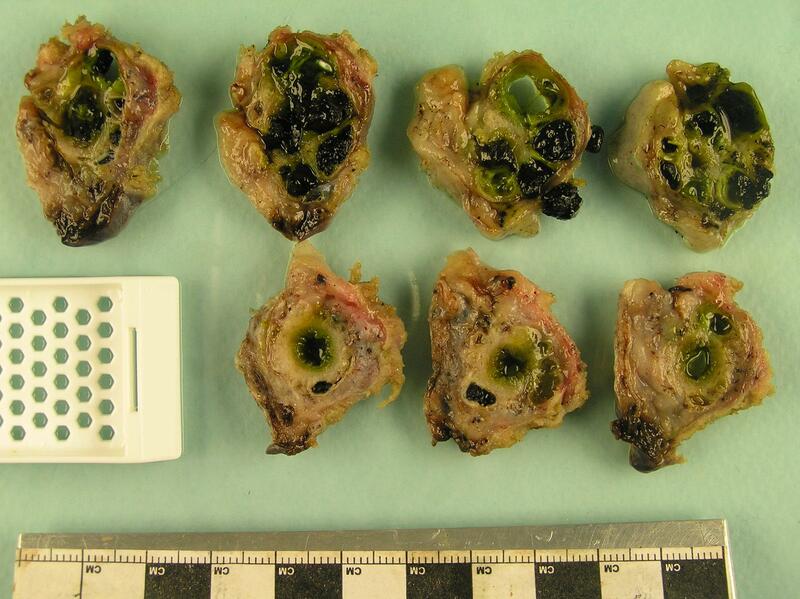 Concretions of bile are present in the lumen of the adenomyoma A microscopic image of the same adenomyoma. Adenocarcinoma of the gallbladder is rare in the United Kingdom but is common in Central and South America and Japan and in Native Americans. The disease tends to occur in people over the ages of 50-60 years and the male to female ratio is 1 : 3. The majority of cases arise against a background of gallstones but other risk factors include assorted inherited GI polyposis syndromes. The macroscopic and microscopic features of the tumour share their basic properties with adenocarcinomas of other parts of the gastrointestinal tract. The most important nuance is that the tumour may sometimes not be visible macroscopically. The carcinoma can invade the liver directly and this is an important staging parameter. The presentation of adenocarcinoma of the gallbladder is often vague and overlaps with that of chronic cholecystitis. Adenocarcinoma of the gallbladder tends to come to attention at a late stage and curative treatment is not possible. It is not unusual for the diagnosis only to be made in a gallbladder that was removed for what was believed to be some form of benign gallstone-related condition. Adenocarcinoma of the gallbladder is believed to be preceded in most cases by dysplasia of the gallbladder mucosa. 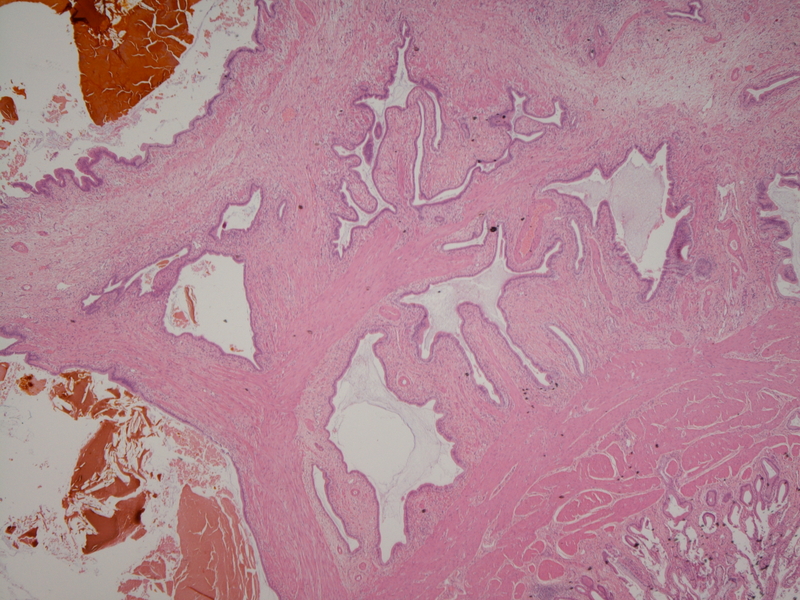 This dysplasia tends not to be in the form of adenomas. Approximately 5% of malignant tumours of the gallbladder are not adenocarcinomas. These other tumours include squamous cell carcinomas. In common with other parts of the gastrointestinal tract (large bowel, small bowel and stomach), the gallbladder can develop adenomas. However, unlike the large bowel, gallbladder adenomas are not a major precursor lesion for adenocarcinoma. Gallbladder adenomas tend to be incidental findings in cholecystectomies performed for other reasons. Adenomas of the gallbladder are dysplastic. Cholangiocarcinoma is an adenocarcinoma of the biliary tree (excluding the gallbladder). The incidence in the United Kingdom is around 1 per 100,000 per year. The disease is rare before the age of 40 years and the majority of cases occur in people who are older than 60 years. The risk factors include the liver flukes opisthorchis viverreni and clonorchis sinensis, primary sclerosing cholangitis and exposure to thorotrast (an obsolete radiological contrast agent). Cholangiocarcinomas can be intrahepatic or extrahepatic. The most common location is at the fusion of the right and left hepatic ducts to form the common hepatic duct; tumours at this site are called Klatskin tumours. The clinical features of a cholangiocarcinoma are usually dominated by the development of obstructive jaundice. Unfortunately, although their location in the bile ducts means that the carcinoma can cause jaundice when it is still only small, cholangiocarcinomas nevertheless tend to present at a late stage, by which point curative surgery is not possible.